The most frequent question people ask me these days is: how long does the HEPA last? This question is important because replacement HEPAs are the biggest long-term cost of clean air. IQ Air charges $370 for its filters. So if you have to replace the HEPA every two weeks, the DIY might not save you money in the long run. What’s Wrong with the Standard Numbers? I’ve been slow to answer because I wanted good data. Lots of filter companies give a single number (often 6 months), but they don’t say whether those numbers are for European air or Chinese air. If they last 6 months in Swedish air, I highly doubt they’d last 6 months in China’s thick air. Another problem is that “6 months” doesn’t tell you how much you can use it per day. Is that 6 months for 24 hours a day? 8 hours a day? A More Empirical Answer: So to get a concrete answer to this question, I think the best way is to get a new HEPA and test how effective it is every day. Over time, we can see when it starts to lose its effectiveness. It’s been tough to start that test because I’ve been busy running tests of new HEPAs, fans, and other purifiers. But thankfully my collaborator Gus volunteered his bedroom as a laboratory, and we now have data from 90 days of tests. Limitation: However, before I reveal the results, I discovered a flaw in the study. I was looking at Gus’s data, and I noticed the particle counts in his room before he turned on the purifier were a lot lower than they were in my room. Why? Then we realized that Gus’s roommate was running his large Blue Air 24 hours a day. That made the air in his house cleaner than it would be in a normal house. Fortunately for science, the roommate moved his Blue Air out on Day 57, so we now have a normal testing environment. It may inflate our estimates of the longevity of the filter because the air was cleaner than it would be in a normal Beijing apartment. 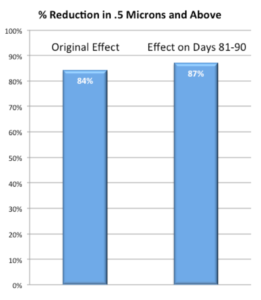 It artificially lowered the estimates of effectiveness for the first 60 days. 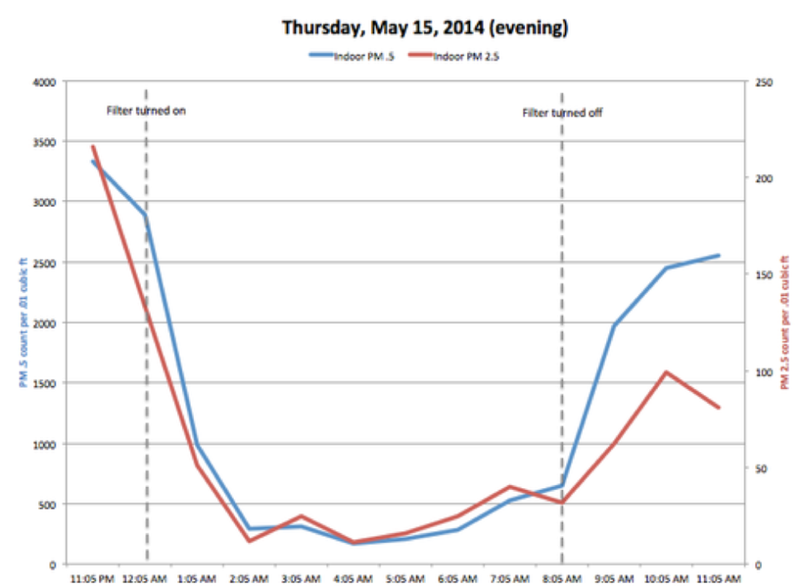 (At the end of the post, I compare data from when the Blue Air was being used nearby and after it was gone.) This also makes it hard to tell whether there were any slight changes in effectiveness over time. Gus will start completely new tests after we finish these tests, so we’ll have a better answer later. We debated whether publishing this data would be useful. In the end, I decided that it’s better to give people some idea of the longevity, as long as I make it clear that there are limitations with the data. Method: Gus used the Original DIY and the same HEPAs we ship from Smart Air every night in the 12.3 m2 bedroom in his Beijing apartment. Gus used the same method as my previous tests to calculate effectiveness–the percentage reduction of particulates from the room air overnight. To smooth out the variability in any single datapoint, I averaged the effectiveness over each 10-day period. Conclusion: This suggests Smart Air HEPAs last at least 90 days without losing effectiveness. Stay tuned to see how the next 90 days turn out! Remember: these results can only be generalized to Smart Air HEPAs. HEPAs from different manufacturers vary in thickness and quality. total estimate of the number of hours the HEPA lasts, you can plug in the number of hours you use the filter per day to get an exact number of days for your own use. For fellow data nerds, I’m posting more details about the tests below. 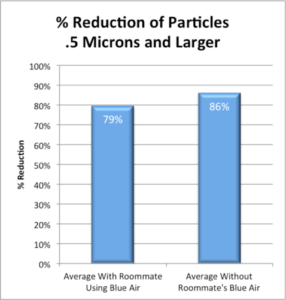 The Effect of Having a Second Purifier on Nearby: As I described in the main text, Gus’s roommate had a large Blue Air running for the first 56 testing days. My hypothesis was that the Blue Air was artificially lowering the baseline particle counts, which makes it harder to get high-percentage reductions. We were able to test this hypothesis after his roommate prepared to move to Hong Kong and shipped his Blue Air there ahead of time. The estimates of effectiveness rose to 86%–even higher than my original tests. This suggests that the earlier numbers were artificially low. 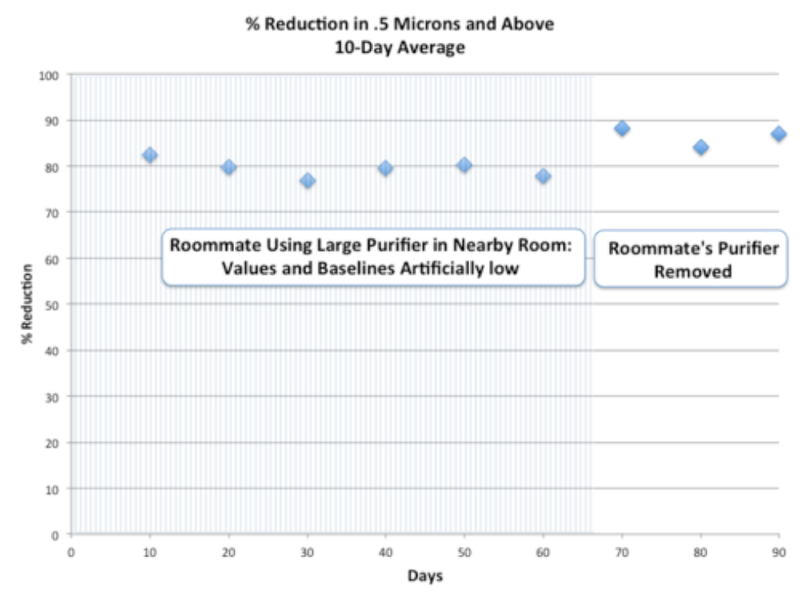 The numbers go up when Gus’s roommate stopped using his purifier, but I think it’s wrong to say the DIY became more effective. What we can say is that, even after 90 days of usage, the HEPA is still working as well as in my original tests. Can we generalize the results? These tests are great for people living in China because the tests are based on Beijing air. 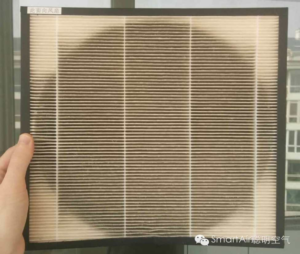 However, the filter may last longer in places with cleaner air (for example, Hong Kong) and shorter in places with dirtier air (for example, Taiyuan). In addition, fluctuations in AQI could make these estimates longer or shorter. For example, winter air tends to be more polluted. Dropoff After 10 Days? The dot for the first 10 days is slightly higher than the later days, which suggests a dropoff after 10 days. However, I think that is not the case. In the first 10 days, Gus was still learning how to use the particle counter, and he failed to set it properly or get a good baseline reading on four of the days, so we couldn’t calculate effectiveness. That means the estimate for the first 10 days is less reliable. What’s Going on at Day 30? The third datapoint (days 21-30) is the lowest. That is probably because the outdoor air was particularly bad in Beijing during that time. The numbers rebound slightly during the next 20 days. Why HEPAs get better with age (to a point). Many people have the intuition that filters get worse over time, but HEPA filters actually get better at removing particles. That’s because the more you use it, the more particles fill up the pores in the HEPA, and it becomes harder for particles to get through. The problem is that it also becomes harder for clean air to get through. So eventually, the HEPA will get so full of particles that it won’t let enough air through. That’s how the HEPA eventually dies. Raw Data: The file is too large to display all of the raw data here, so I’m making it downloadable from my personal site (click here to download). When you guys do the test, what level of containment do you normally have to outside air? Do you open windows at night? Are the windows slightly cracked all day? Are the windows totally open? The windows were closed during the tests. But since the air purifier is off during the day (when nobody is home), the level of indoor particulate air pollution would typically raise to the same as the levels outside. This is because despite how well you close your windows, there are always ways for pollution to re-enter your room.